Today I’m going to be making, chicken curry. After eating very Japanese dishes like Osechi and Ozouni, we crave curry! 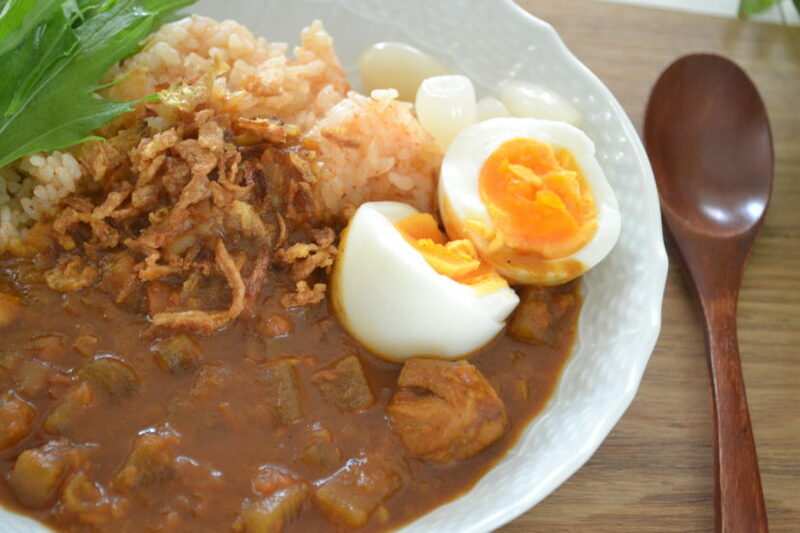 As you know, we love curry rice so much! We have a very famous TV commercial of boxed-curry saying “Osechi is good, but curry is also good!” That much! Lol. In my previous curry rice video, I used boxed-curry. But I have some request without using boxed curry. So this is it! ※Or you can use your blend of turmeric, Garam Masara, cumin, coriander, chili pepper. 1) Chop onion in a food processor. Heat heavy bottom pot on high. Add vegetable oil and onion. Cook on high until the moisture evaporates and start browning. Put the lid on and turn the heat to low. Steam the onion and draw all the moisture. Stir constantly to brown evenly. 2)Meanwhile, Cut the other ingredients. Chop the carrot in a food processor. Peel the daikon radish and dice into half an inch. Mince garlic cloves and ginger. 3)Cut your chicken thigh into chunks. Toss in a pinch of salt, half a teaspoon curry powder and yogurt. Toss to coat evenly and set aside. 4) After 10 to 15 minutes, your onion should look like this. As you already realize that in my cooking, I use caramelized onion often for Western-style dishes especially for curry. I believe the caramelized onion adds Umami to and deepens my recipe and I can’t make any without it. Add minced garlic and ginger, continue cooking until fragrant. 5)Add minced carrot and cook until soft for 5 to 6 minutes. Add the curry powder, cook, until fragrant. 6)Add in the chicken thigh and cook until the outside cooked for about 5 to 6 minutes. Add in flour and cook until distributed evenly. 7) Pour tomato juice, stir to loosen the curry paste. Add in bay leaf and chicken soup cubes. Add diced daikon radish and put the lid on. Cook 15 to 20 minutes or until everything melts together. 8) Add salt to season. And I add apricot jam left in my fridge to add sweetness and the shine. Cook until everything well combined. Look at this beautiful curry! You may think the daikon radish is not goes well with curry, but actually it tastes so good. When you take a bite, you will know how it works. The moisture from daikon soften the spices. Smell so curry in my kitchen and my neighbors. 9) Ladle as much as you want over the rice. Today, I have prepared carrot rice. Add grated carrot and a pinch of salt when you cook the rice. The color is so vibrant and goes well with my curry. This curry is a little bit spicier than the boxed-curry, so I like to serve with boiled egg to make it mild. Sprinkle deep fried onion or the final touch. These are Rakkyou sweet pickles. It’s a staple condiment for curry rice. And it’s done! Let me taste! Take a little bit of everything on my spoon. It’s spicy but rich in Umami. Chicken thigh is fork tender. Everything melts together in my mouth! My crave for curry is finally filled with the chicken curry.